More than just a hostel. Simple but stylish, and provided with all the facilities you need for a comfortable stay. Part of Cirencester's former brewery, the Cotswold stone Barrel Store has been beautifully and creatively transformed into up to date accommodation; it is light and in deference to its owner, New Brewery Arts next door, has crafted touches throughout. Though simple, this accommodation has style and flair and has been built to meet Passivhaus standards. Charterbrae were asked to design comfortable, high quality beds suitable for our rooms. Shaped by hand and made by ‘Black Country’ traditional trained welders, the beds are built to last, whilst conforming to the latest British Standard Safety Regulations. Sitting Firm see chairmaking as a living tradition and are known for making modern Windsor chairs. 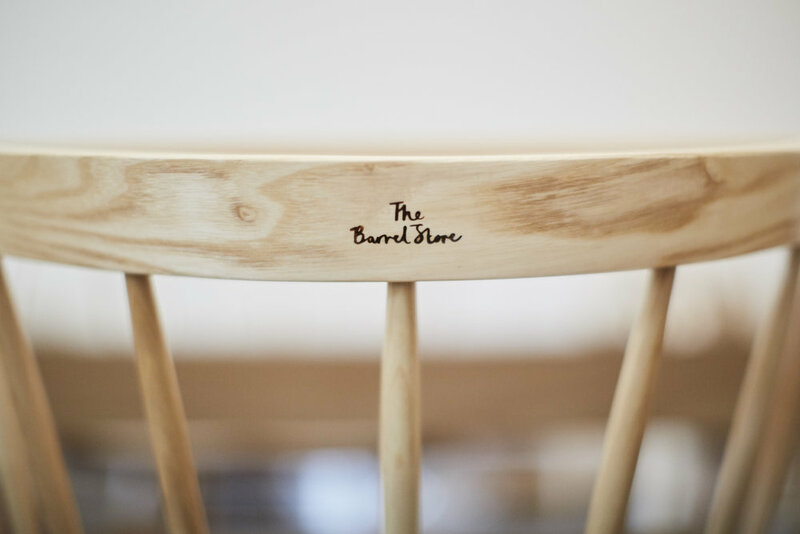 We're lucky enough to have their beautiful chairs in the Community Room at The Barrel Store. Cotswold Woollen Weavers who are based in Filkins, not far from Cirencester, made the colourful Shetland wool throws. The long silky wool of the hardy Shetland sheep with its combination of softness, warmth and durability keep you warm at The Barrel Store. Loco Glass, based at New Brewery Arts, designed the bespoke swallow pendant shades. Loco are one of the on-site makers at New Brewery Arts and are situated right next door to The Barrel Store - their studio welcomes visitors to come and see them glass blowing! Though simple, The Barrel Store has been built to Passivhaus standards, giving increased energy efficiency which reduces our building's ecological footprint. It is an ultra low energy building which requires little energy for heating and cooling the space. After Cirencester Brewery closed in 1937, the buildings remained disused for a number of years until a local group proposed their repair, transforming them into craft workshops, which opened in 1978. The Brewery's old barrel store became the Niccol Centre, providing classes, courses and a theatre space and, in 1990, joined with the workshops to form Brewery Arts. Following extensive redesign and refurbishment, the current galleries, shop, workshops and café of New Brewery Arts opened in 2008 and, in 2016 New Brewery Arts opened The Barrel Store, another chapter in the history of the Cirencester Brewery buildings.